Man’s perennial questions are echoed by Hanneke Beaumont’s work, but she also raises more specifically contemporary issues as in her cast iron sculpture «Abundance & Chaos». Many of her figures appear neither male nor female, neither young nor old. They do not appear as portraits of particular individuals, nor are they modelled after idealised human forms. Physically, they are approximations of human beings, and as such, they provide a way to consider, from a distance, general ideas about the nature of the human race. Their positions are not aggressive or provocative, but neither are they resigned. Fragile but strong, motionless but ready to move, these figures seem in a weightless spatial equilibrium – their human character tied to a string of thought. Dressed in timeless «clothes», partly structured material, intertwined with the body, they defy our perception without shocking our sensibility. In Brussels, she is instantly recognised for her monumental installations, namely «Stepping Forward» installed in front of the EU Council, «Le Courage» at the entrance of the Erasmus hospital, «Le Départ» at Brussels airport or «Interaction & Self-Protection» in Ganshoren. Present in numerous public and private collections, Hanneke Beaumont enjoys an international reputation and her art is exhibited worldwide. The artist shares her work time between Pietrasanta, (Italy) and Middelburg (Netherlands), where in early 2015 she acquired a XVII’th century warehouse as studio. 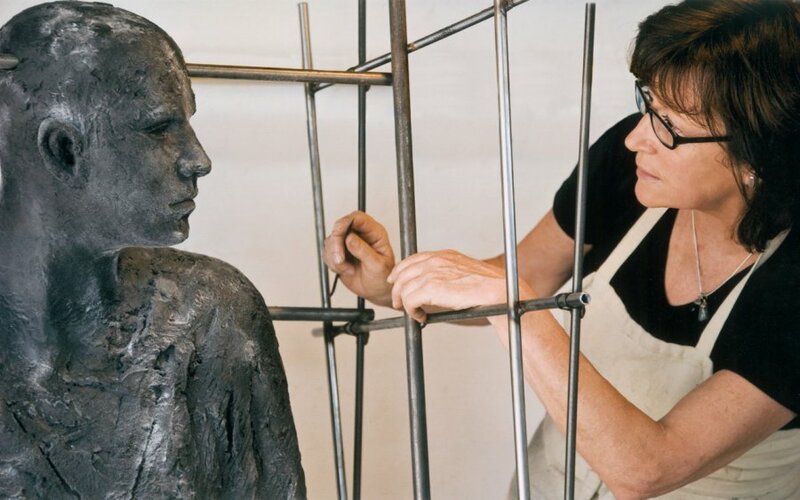 Her sculptures are realized in terracotta, bronze or cast iron.